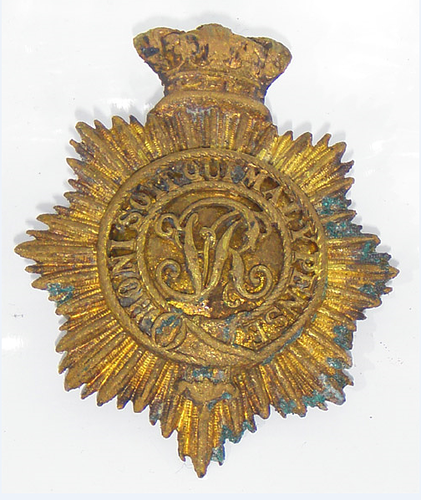 Sure that’s Victorias monogram, but id of any regiment etc eludes both Google and I. Still has the remains of the pin in the clasp, and the threaded ‘nuts’ still unscrew! Just love anaerobic sludge. 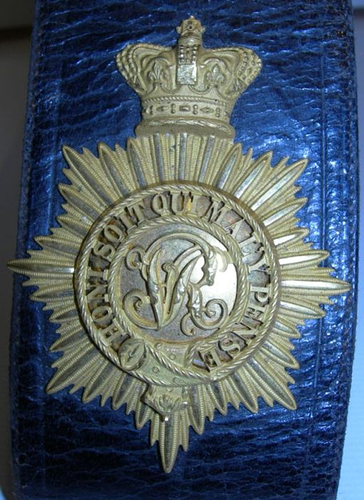 I would also check out Royal Engineers as I believe they also used the motto. Damm nice find Mud. Great condition too. Gottit! Thanks for the brain-nudge MK. 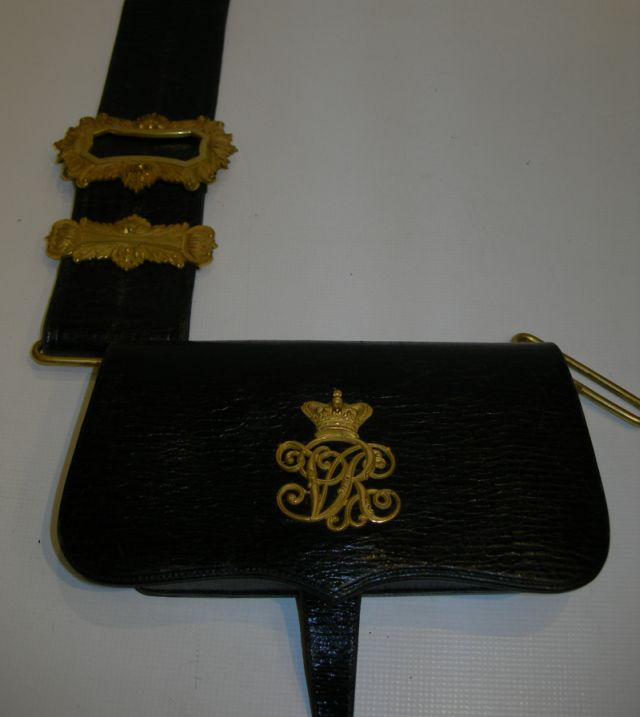 Arr, it be a surgeons cross belt badge off the front strap. “Heavily gilded on a silver base” Which explains why it belted me in the ears! Now, given this one still had the pin and nuts in place, I’m betting the whole caboodle went in the tide - which means there are still the others to be found… EASTER ROAD TRIP! Cheers Chris, Looking forward to seeing your treasure cleaned up - Just gently chisel off the gunk with a toothpick, don’t polish or rub if you can resist it. Excellent. That is an amazing find. like that dont find many off them on the beach.i think i would attack it with 600 wet and dry get all the surface corrosion off and then use the dremal and brasso the thing up to new,would sit well in your display cabinate,great find. Nice find! Any idea on the date? We used to find relics with that green corrosion back on the east coast in the US. It looks like it might be gilded. If you want to save the gilt, you might try lemon juice first and if that is not strong enough try a brief soak in ammonia. Just for a couple of minutes at first. Be sure to rinse it off well with water afterwards. 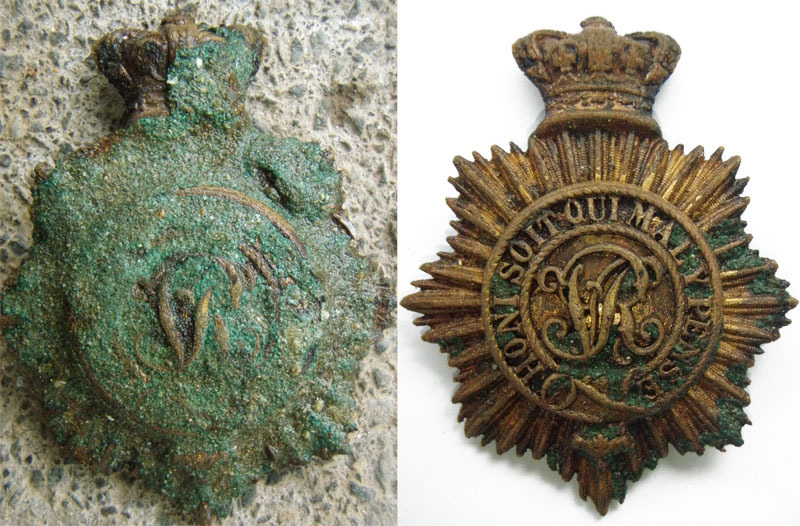 I have had some beautiful gilted and silvered buttons come from heavily corroded brass like that. Just keep a close eye on it as it soaks: you don’t want it in the too long. Those chemicals should also help to preserve a nice patina so it still looks “antique” and authentic. 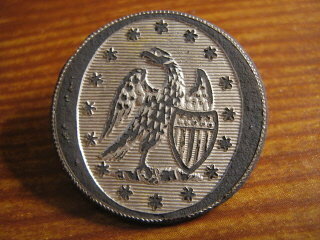 The button below is an 1820s to 1830s US militia button I found a few years ago. It received the ammonia treatment and I think turned out pretty well. These are apparently hard to date given the general service of them, coupled with Vickies long reign. Logical dating would put it with troop movements mid 19th century during the Maori Wars as this was one of the few places where boats could put in in the area. There wasn’t a strong European presence in this area then. I never clean to try and restore to ‘mint’ finish - stuff like this, you always end up making it worse (losing gilt or detail). This was worked with an assortment of calibrated and highly specialised tools (matches, toothpicks and bamboo skewers ) and is far as I’m going to go. This is in such good nick, I was able to remove the pins holding the two pieces together, and the gold plate under the centre boss is still intact, would have been a fantastic sight in its day. I’ve recorded its details, and it’ll be going to a museum once I’ve enjoyed its company for a while. And Roy, Dremels and Wet and Dry… Behave yerself! I’ll follow up on Johnson, come across him a few times in Papers Past, but not that reference. Cheers. Sticking it in the big machine today to see what the gold is coating. I like it. An excellent find and considering its age in extremely good condition. Military badges, medals and militaria fetch good money. Cheers Lammerlaw. “…in extremely gold condition” Freudian slip? The big scary machine has confirmed gold on silver, which gives an officers/surgeons badge. Nice. Oopsie - when you are the countries on 21 year old who had seen 65 and more summers then anything more sophisticated that a wooden telephone with a crank handle on the side is too darn sophisticated and my yuppy phone that my son gave me for Christmas corrects my version of the Queens English and turns it into something I did Not actually type…or maybe this one was just a missytook that I made…corrected now. I concur. Although I am only old enough for the Bakelite manual phones on party lines (Ph: 173M), my smart phone, which is embarrassingly smarter than I, sits in the drawer. Slide rules and log tables are where it’s at! The Johnsons’ were THE family in Whananaki, only other notable was Thomas Morris who owned the store. This is a bit of a long read - mostly concerns maori, as it is to do with The Treaty.